The LAES curriculum allows students to mix computer technology and media, providing them with the opportunity to work on a wide variety of interdisciplinary projects. In addition, field trips to media businesses help establish relationships and provide insight into potential career paths. 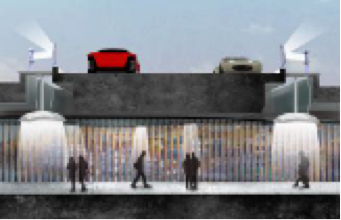 Project Goals: To develop, deploy and test a series of 1-to-1 scale interactive architecture and expressive technology installations in a pedestrian passageway connecting Old and New Sacramento. 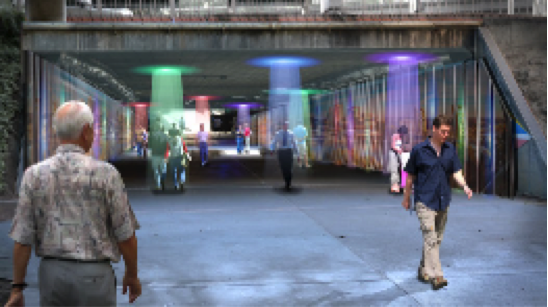 Project History: "Halo" will feature an overhead arrangement of interactive LED lights creating a colored halo of light around each person entering the passageway, and following them as they walk through the tunnel. The halos will be interactive; allowing participants to "kick" their halos down the passage to other halos. Accompanying the overhead lights will be an installation along the walls of the passageway that uses a folded poster format to display one version of the poster’s image when seen from one direction, and a contrasting version of the poster when seen from a different direction. 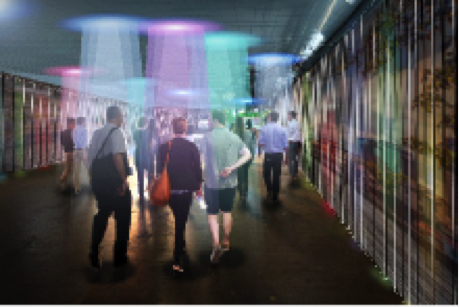 The poster installation will be backed with interactive LED lights that will react to the motion of people in the passageway. Installation art piece on the effects of gun violence in the U.S.
Project Goals: The Sense of Safety (SOS) Project was designed to start a dialogue about gun violence in the U.S. by asking visitors: "How safe do you feel at Cal Poly?" Participants responded by leaving a thumbprint on the appropriate panel. 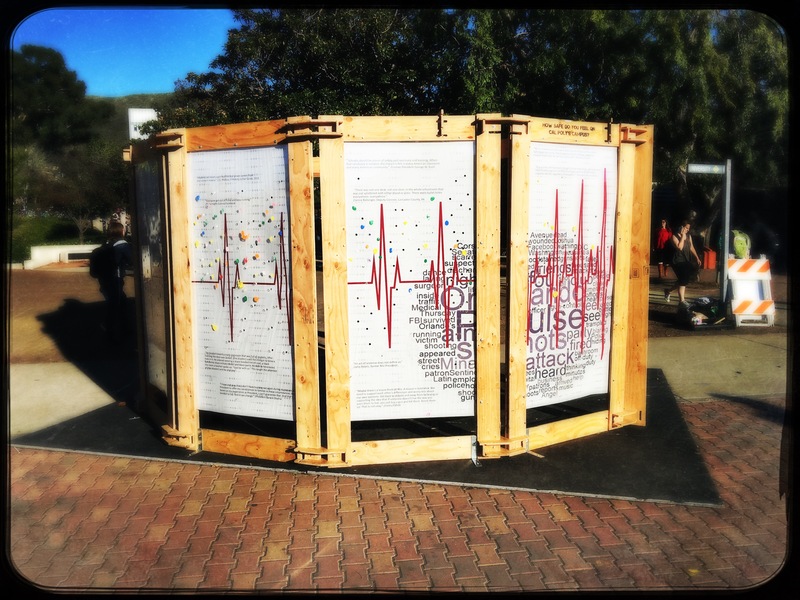 Project History: The SOS Project was developed in response to the 2016 Pulse Nightclub shooting in Orlando, Florida. The installation formed an arc of linked plexiglass panels, each comprising a 2-year period between 2004 and 2016. 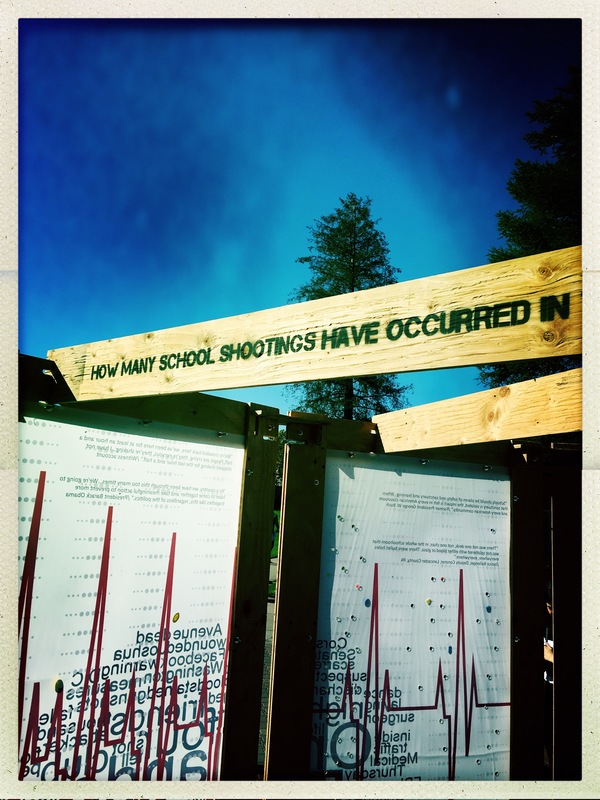 The individual panels were pierced by a number of holes, each hole representing a school shooting that had occurred in the U.S. during the given period. Visitors were encouraged to contemplate and discuss the impact of gun violence on their own lives. Written across the inner panels was the question: “How many school shootings have there been in America during the last twelve years?” The shocking answer: there were more than 300 school shootings in just twelve years. Project Goals: Part of an international movement of DIY- and STEM-related design fairs celebrating hands-on learning and sustainable technology development. 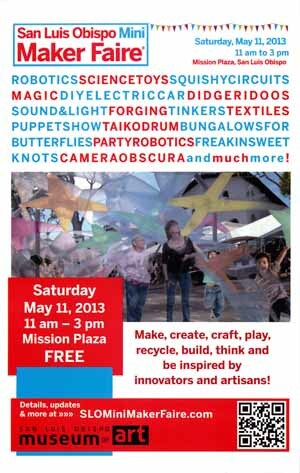 Project History: This highly successful community event, supported by MAKE magazine and the MAKE Community Development Group, attracted more than 2,000 visitors to downtown San Luis Obispo in 2013. Working in collaboration with the San Luis Obispo Museum of Art, a consortium of K-12 STEM educators, faculty from the Cal Poly College of Engineering (especially Dr. Kathy Chen from Materials Engineering), SLO city planners, local commercial partners and sponsors (including iFixit), and Dr. Thomas Fowler and his architecture studio students, the LAES program and the Center for Expressive Technologies provided technical, planning, and site management support for SLO's inaugeral Mini-Maker Faire in 2013. The event was so successful that the LAES program and CET went on to sponsor and coordinate the event with the City of San Luis Obispo again in 2014 and 2015. 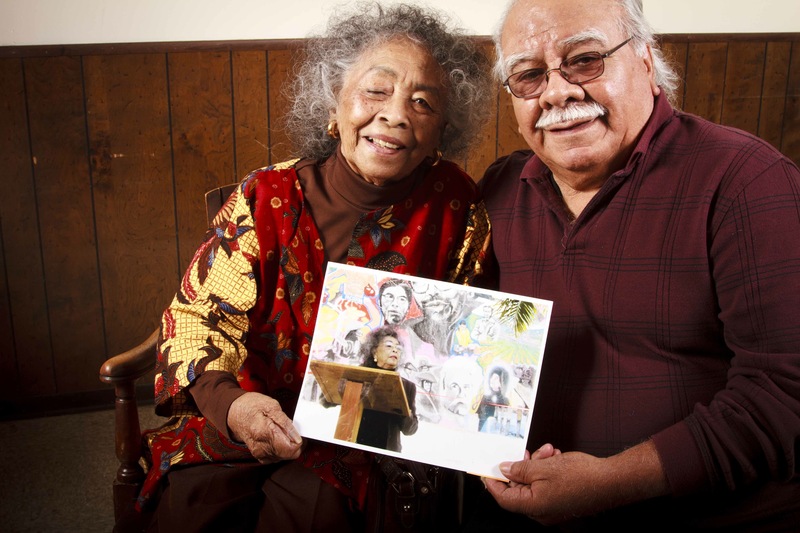 Project Goals: Using digital media to preserve and disseminate the stories of underrepresented communities on the Central Coast. 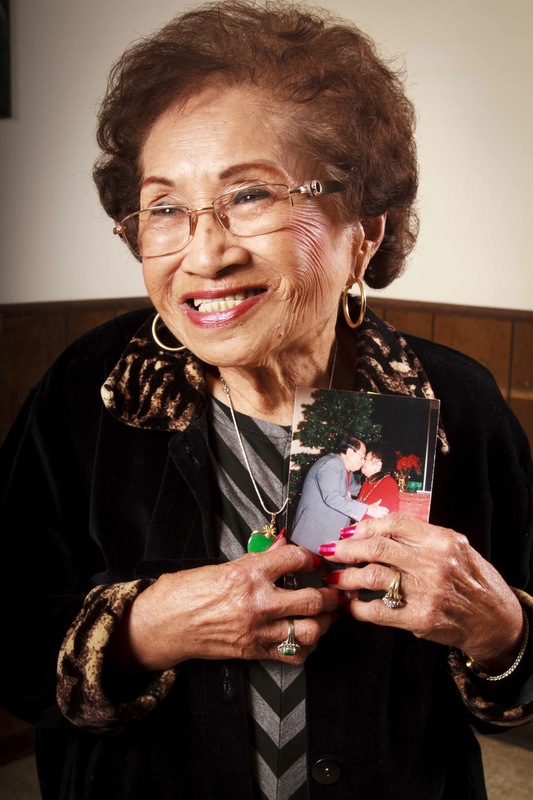 Project History: In 2011 LAES students and faculty began working with Dr. Grace Yeh (Cal Poly Department of Ethnic Studies) to record interviews; digitize photographs, documents and artifacts; and host community events and public programs about the experiences of the local Filipino American and Japanese American communities. While working on the Re/Collecting project, we organized the collection of geo-spatial and time data to be recorded with every object, so it could be tagged and incorporated into the next iteration of the PolyXpress system. Addition of this extra layer of data allows for the creation of an interactive exploration of the database data by using PolyXpress to visit the sites referenced in the photos and video, thereby allowing participants to hear and see the recollections while visiting the location in question. The first working prototype of PolyXpress integrated with the Re/Collecting database for the Pismo Beach area went live in spring 2014. 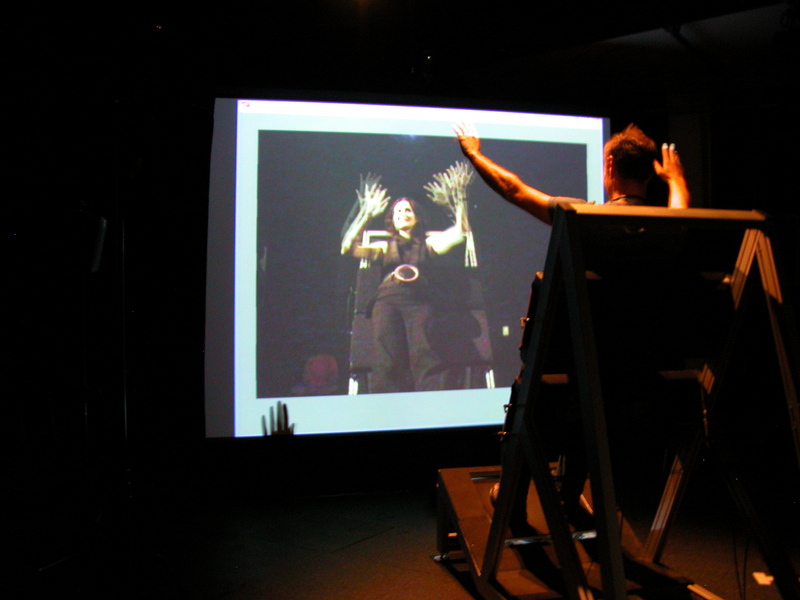 Project Goals: The creation of an immersive theatrical space and interactive audio re-combination to enhance the experience of a live theatrical performance. Project History: In summer 2012, Dr. Anderson (Cal Poly Department of Theatre and Dance) asked us to collaborate with her on a community-sponsored, readers-theater production of “8,” to be held at the Spanos Theater for a one-night performance sponsored by PFLAG (Parents Families and Friends of Lesbian and Gays) and a number of other community LGBTQ support organizations. 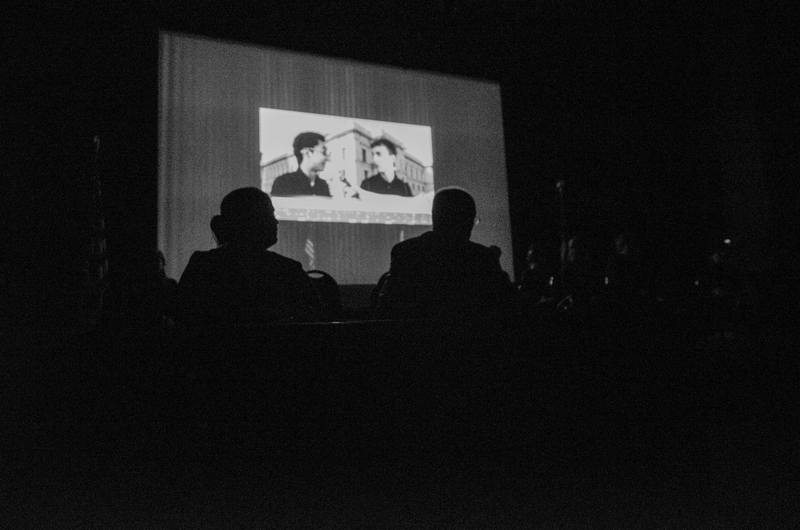 Working with Kris Gottlieb (the show’s producer and the local director of PFLAG) and Dr. Anderson, our program designed a video DJ system to create interactive projections that would situate the show in a California courtroom, and then switch occasionally to a "live" news video projection. We also designed the interactive-mix audio system that was used outside the theater pre- and post-show to simulate the experience of walking through an extremely vocal crowd of pro-Proposition 8 protestors (including violently anti-gay protestors). 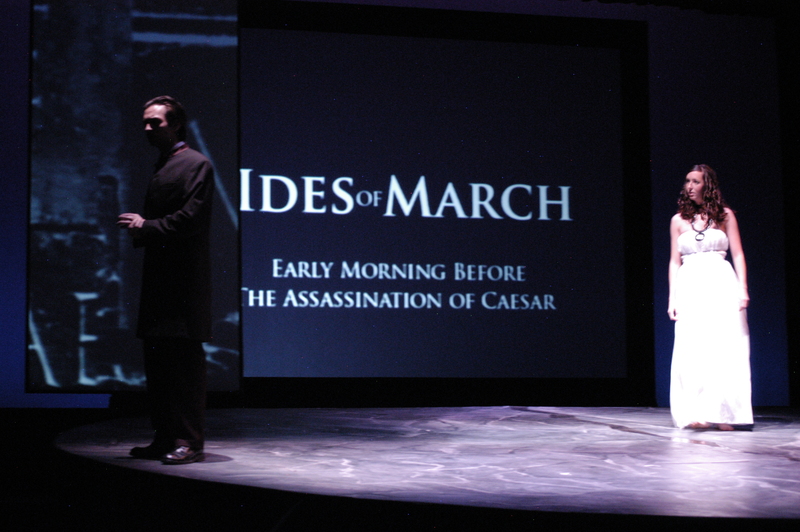 All media elements created for this work were distributed to other productions so they could be used throughout California in the weeks that followed. Project Goals: Creation of a campus-wide collaborative organization to promote the interdisciplinary project development process at Cal Poly. Project History: Beginning in August, 2010, the LAES program created a working group on campus called the Expressive Technology Studios Group. 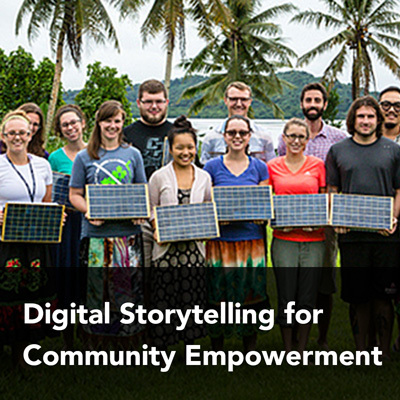 Dr. David Gillette led this collaborative team of faculty, administrators, students, and commercial/community partners through a series of interdisciplinary arts and technology projects, expressive technology design workshops, as well as interdisciplinary storytelling and ethnographic recording course modules. Commercial and community partners include the San Luis Obispo International Film Festival, the San Luis Obispo Museum of Art, the San Luis Coastal K-12 School District, the Pageant of the Masters (Laguna Beach), DTS, Animation Studios, ConsciousBuild, the San Luis Obispo Housing Authority, New Times SLO, and a number of local arts and education collaborative organizations. 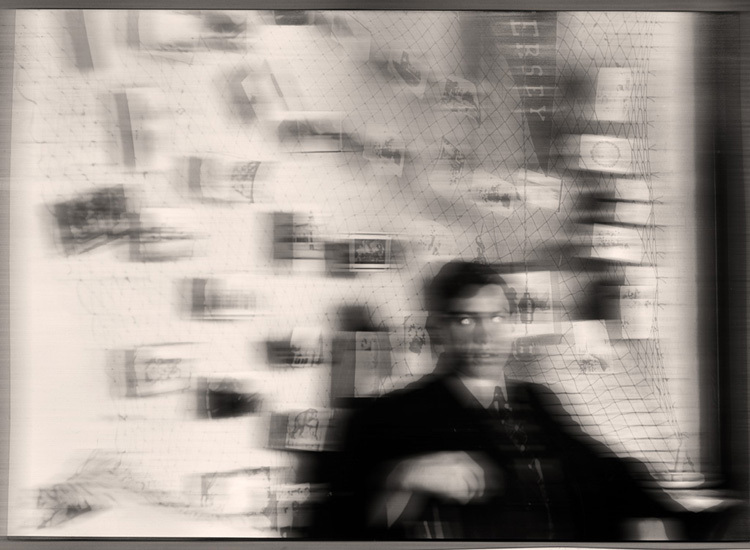 Project Goals: To encourage visitors to think more carefully about the history of photography, its common association with the sense of “spirit” in narrative, and to reconsider the meaning of “truth” and “fiction” as part of the archival collection and display process. Real, site-specific photos taken by local photographer Frank Aston (1908-1947) were integrated into the system for added authenticity. 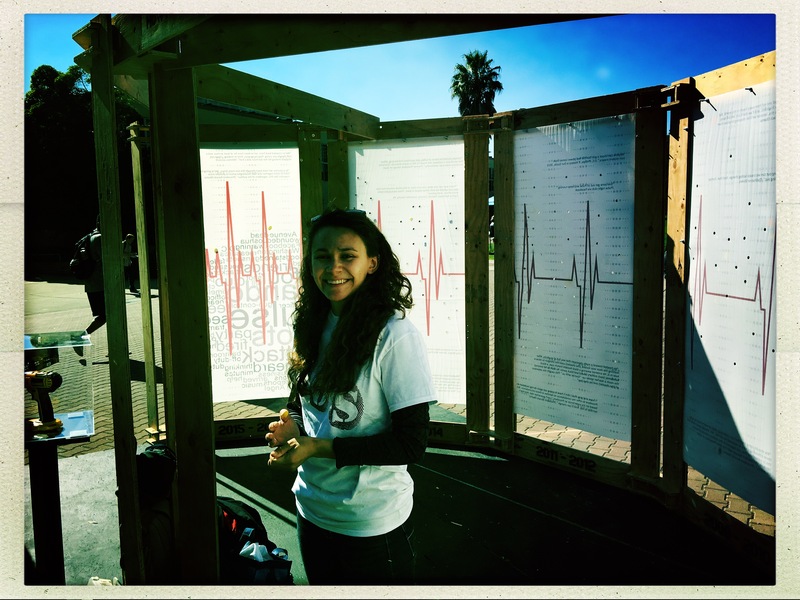 Project History: The first iteration of PolyGhost was a 3-month interactive exhibit in conjunction with Cal Poly's Kennedy Library and Special Archives. The exhibit displayed the Archives’ collection of Frank Aston’s original work, his glass plate negatives, and a number of Cal Poly's foundational documents. These historical objects were combined with a fictional history created by Media Arts, English, and LAES program students. This exhibition was called: “Look the Other Way,” and featured twelve interactive digital and analog exhibits that we created. We also designed an interactive game structure that began with the exhibits, led participants into the library stacks for more information, and directed them to various campus locations. We worked with Dr. Michael Haungs to facilitate these outside-the-library story experiences, first called the PolyXpress system (later changed to the PolyGhost system). A large number of LAES, English, and Media Arts students created additional backstories for the “Look the Other Way” exhibit and PolyGhost system, and a number of Dr. Haung’s graduate Computer Science students developed the first working prototype of the PolyGhost software. 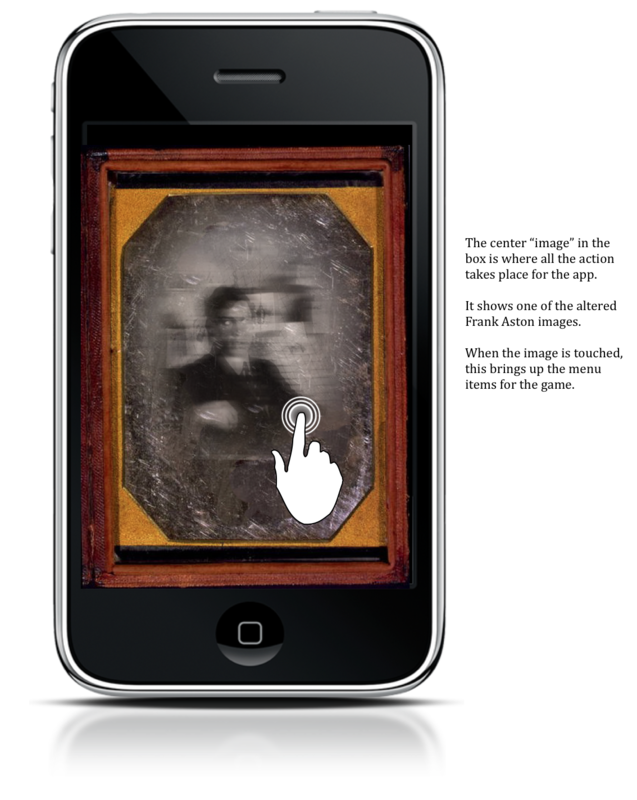 We designed the initial interface for the system to look and function like a type of “ghost-inhabited” daguerreotype print inside a palm-sized wooden case. This design, while effective with users and pleasing in appearance, also proved to be extremely difficult to maintain across platforms and software versions and so has now been set aside until the entire software development process is complete. 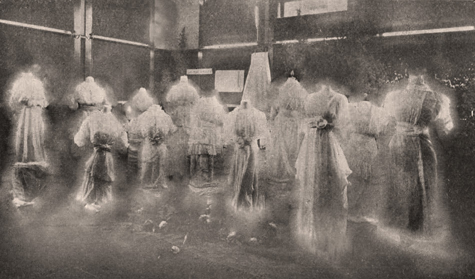 The daguerreotype interface, however, does successfully demonstrate the connection between the PolyGhost stories and the history of media use and development. Project Goals: For the Orchesis Dance Company's twenty-two dancers to serve as a form of embodied media: screens become dancers and dancers become screens. Project History: With the dancing images moving from the screens directly onto the dancers themselves, the final performance was a thirteen-minute modern interpretation of tango, with screens suspended above and behind the dancers. A video triptych of the dancers dancing in a wide range of venues was projected onto the screens, all of which was pre-recorded and mixed live to interact with the dancers on the stage. 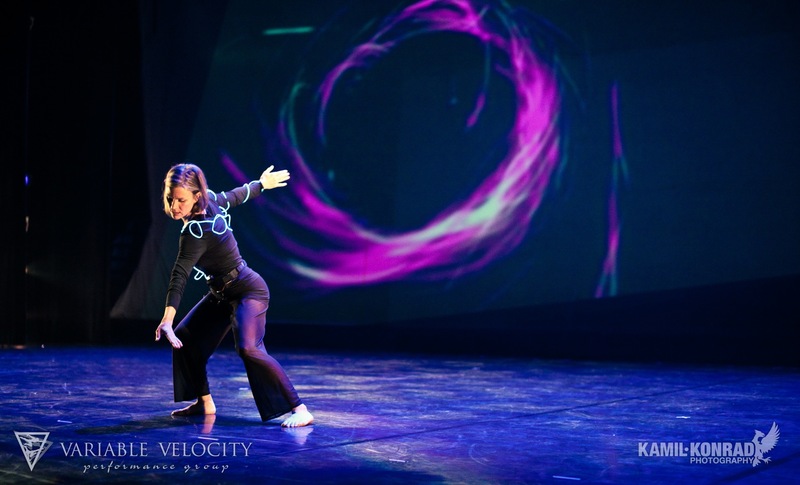 We used performance tracking systems, heart-beat monitors, and extremely flexible projection screens that the dancers could wear during the performance. Project Goals: Use play to comment on way modern visual and broadcast media separates important events from their original contexts and recasts them in fragmented pieces of argument that can be used for both positive and negative purposes. Project History: Working with Drs. Josh Machamer and Tim Duggan, we utilized the embodied media concept by combining the movement of the actors on stage with the movement of the screens containing live video projections of the actors as a type of meta-reference to onscreen motion being more “realistic” (due to its large size) than the actual movement of the actors on the stage. Our team created windows into new, dynamically changing spaces and narrative contexts impossible to produce with standard theater scenery and backdrops. 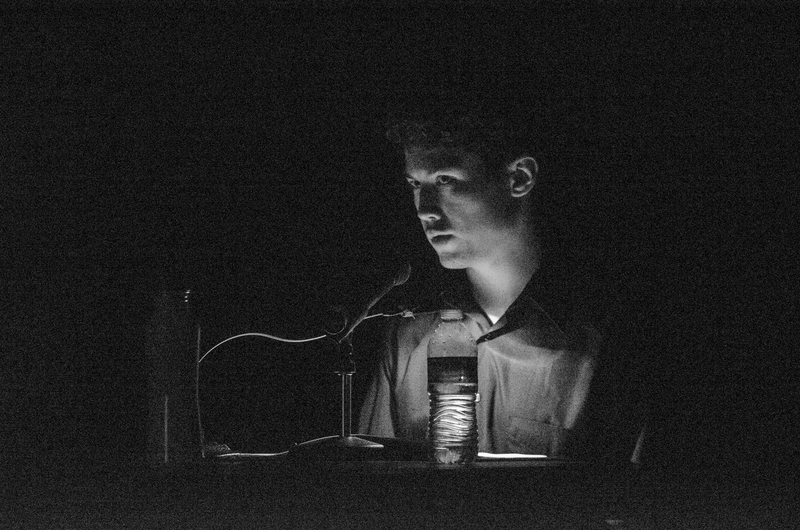 Our overall approach to the use of technology in the production was for it to be technically and artistically seamless, while exploring a variety of new methods for using motion on the screen to create a sense of depth and immersion for the actors and audience members. 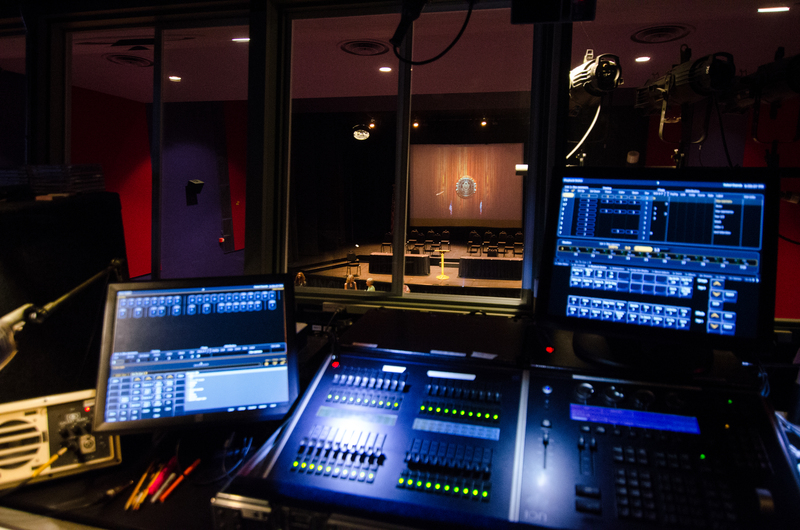 Award(s): Our team’s work was awarded the Kennedy Center American College Theater award (KCACT, Section 8) for special achievement in technical theater. Project Goals: The Housing Opportunities through Modular Environments (HO:ME) Project's purpose was the design of 18 single resident occupancy (SRO) living spaces as well as a new office building for the Housing Authority of the City of San Luis Obispo using recycled industrial shipping containers. 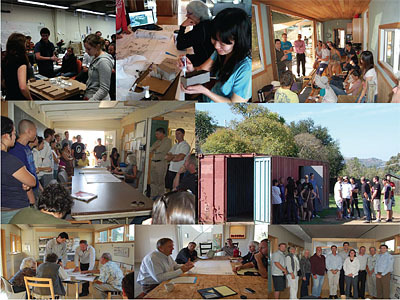 Project History: The ultimate goal of the documentation work was to create a model for how this type of successful building collaborative could be replicated in other communities around the US and abroad, with an emphasis on the efficient reuse of materials built upon the benefits of having a university system working directly with local government to improve the local community. Drs. 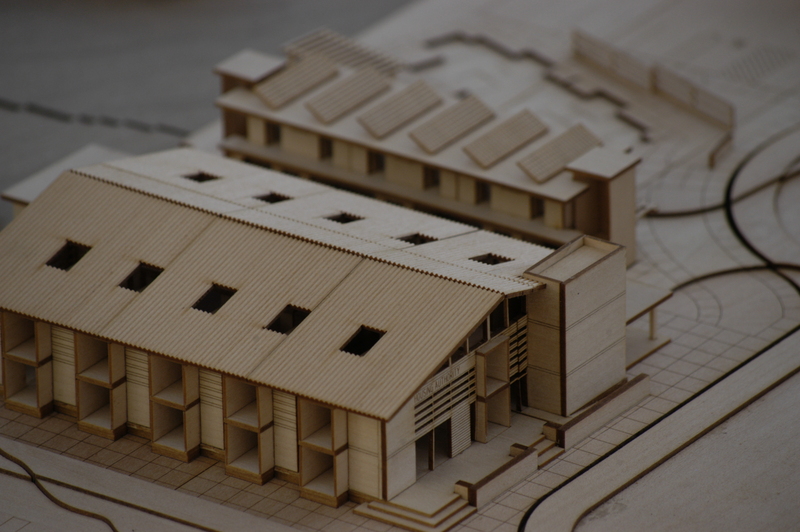 Thomas Fowler and David Gillette made the HO:ME project one of the central teaching and development projects for their Architecture and LAES courses. 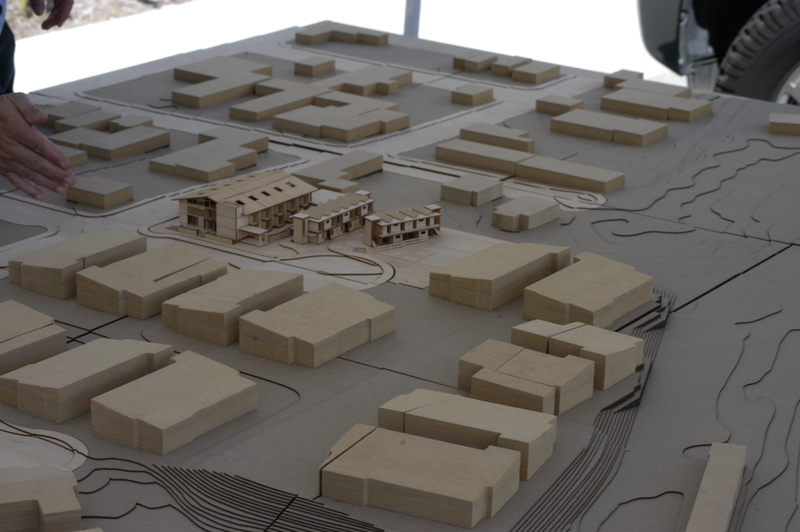 More than 100 students worked on it during the 2009-2010 academic year, including students in Architectural Studio, Media Arts, and Interdisciplinary Studies courses. LAES students carried forward the documentation of the project, focusing on the construction materials involved, the political and social management issues associated with developing the project in a public context, and continued to help organize and fine-tune the collaboration between the city, the university, and the builders. Award(s): In 2010, Drs. Fowler and Gillette were awarded the Cal Poly President’s Award for Service Learning for their work directing and developing the HO:ME project. 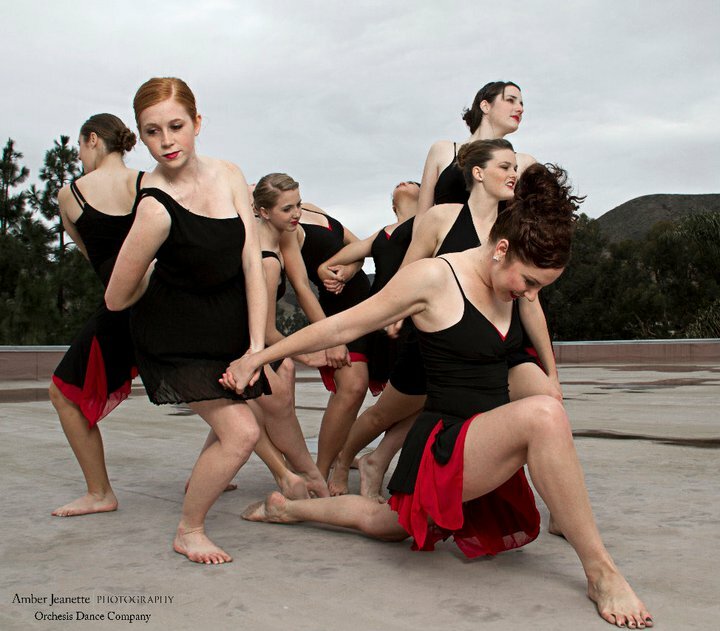 Project Goals: To help participants think in new ways about the connections between their bodies and how they communicate through movement. We also sought to encourage participants to connect this embodied media communication process with the basic tenets of social collaboration and the sustainable use of resources. 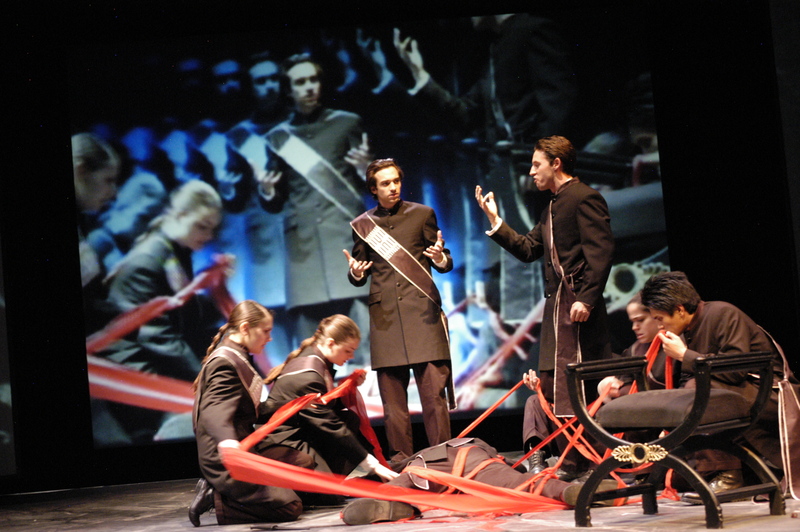 Project History: Dr. Keith Armstrong and the LAES program hosted an American-interaction-node during the first ten days of the Beijing Olympics’ arts show in June 2008. "Intimate Transactions" used the Internet and motion sensors hidden in a chair/table to track participants' motions. 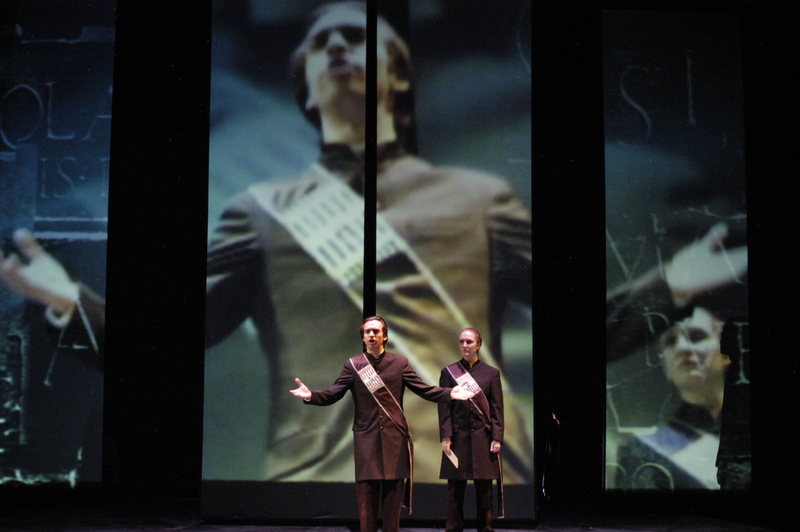 The motion of their upper and lower torsos and of their feet controlled an abstract, ghost-like avatar projection of themselves that interacted with objects on a large screen. 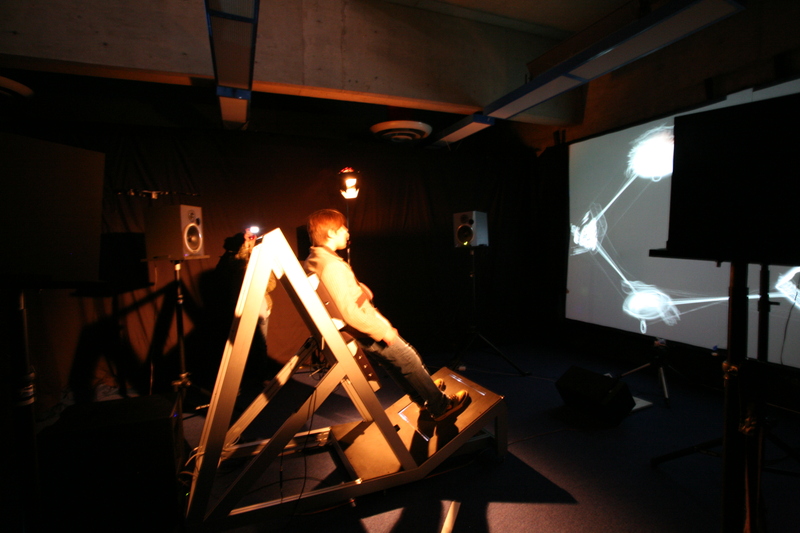 A connected sound field allowed participants to feel the movement of the work’s other participants, who were connected at the opposite end of the system. 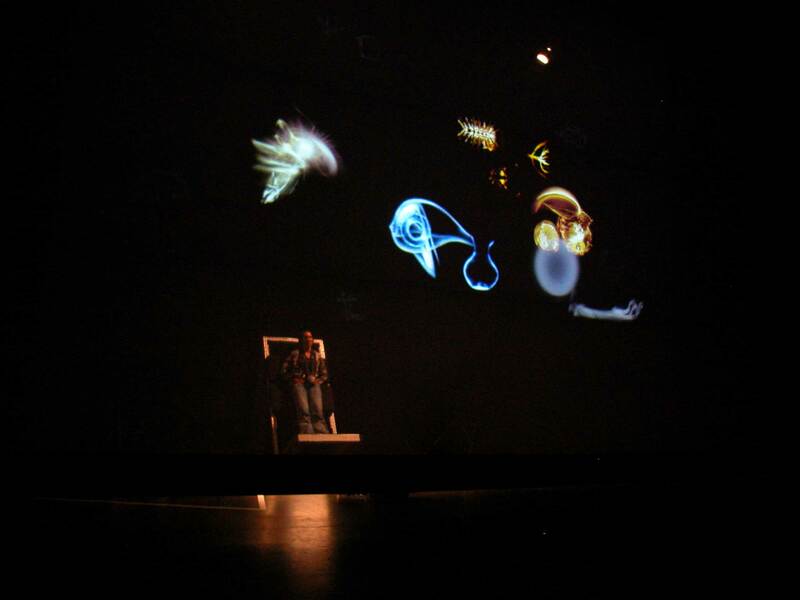 Using the motion of their bodies as well as the visual and audio guides received from the screen and speakers, the participants (strangers located in different cities or countries) eventually learned to collaborate and move together. A small group of students in the (then) fledgling LAES Program at Cal Poly provided the only open Internet video/audio link between thousands of Chinese and international visitors at the National Art Museum of Beijing and scores of daily visitors at the Cal Poly site.